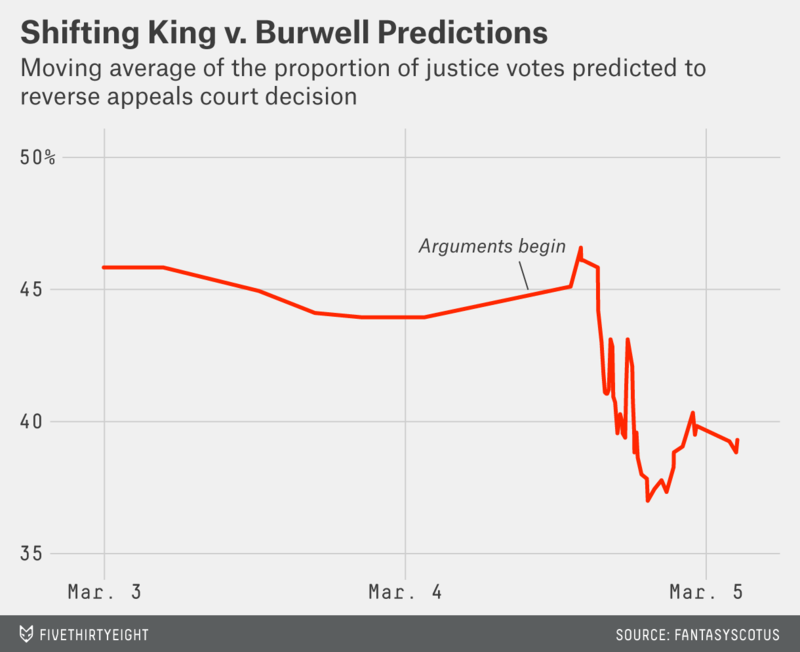 UPDATE (June 25, 10:53 a.m.): In March, Supreme Court predictors ruled that Solicitor General Donald Verrilli won the oral argument in King v. Burwell, and the odds that subsidies provided by the Affordable Care Act would be upheld immediately jumped up. And as we learned Thursday, they were right. The law was upheld by a 6-3 vote, exactly as predicted by the crowd at FantasySCOTUS. Solicitor General Donald Verrilli won Wednesday’s oral arguments in King v. Burwell, the latest challenge to the Affordable Care Act. Or at least that’s what the wisdom of the crowd is telling us. Here are the shifts in the predictions over the course of the past few days. The plot represents a rolling average of the last 200 predictions entered by FantasySCOTUS players. The proportion of predicted votes to strike a blow to the ACA fell sharply Wednesday. Jeffrey Toobin gives an overview of the oral argument — and his reading of the tea leaves — in The New Yorker. He suggests that Roberts’s relative silence may have been the most telling of all. The crowd agrees. Roberts was seen as significantly less likely to vote against maintaining the ACA than he was before oral argument. Kennedy, another swing vote, also came away seeming less likely to vote against the ACA. Oral arguments have thrown us off the scent before, however. In the previous major ACA challenge, Verrilli’s performance before the court was panned. “He was passive,” Toobin told Politico in 2012. “He was stumbling. He was nervous. I was just shocked.” But Verrilli emerged victorious then.